There seems to be an unwritten law among the colonizers and imperialists that the peoples they have attacked the most must be insulted the most. U.S. history is replete with examples. None is more repugnant than the universally offensive treatment heaped on the Democratic People’s Republic of Korea by the U.S. political establishment and media. Since occupying the south of Korea in 1945, the imperialists have tried to defeat the Korean people’s efforts to build socialism and overcome the poverty and devastation they inherited from decades of Japanese colonial rule. From 1950 to 1953, the Pentagon launched one of the most unequal wars in history against the DPRK. But the Korean Revolution succeeded anyway in the northern part of the peninsula. Showing incredible morale and bravery, the newly liberated Korean people in the DPRK under the leadership of the legendary Kim Il Sung and the Workers’ Party fought the invaders to a standstill and then rebuilt their country. So the imperialists, while still occupying the south and holding annual “war games” that threaten the DPRK with both conventional and nuclear weapons, have intensified their insults against the leaders of north Korea. Workers World totally rejects this war propaganda offensive. It stands in solidarity with the DPRK, its people and leaders, in defense of their sovereignty and social system. “Workers World Party sends comradely greetings to the Workers’ Party of Korea on the occasion of your party’s 7th Congress. “Many years have passed since the great revolutionary struggles that liberated the northern half of Korea from the colonial oppressors and their puppets, and all that time the Workers’ Party of Korea has remained true to its commitments. 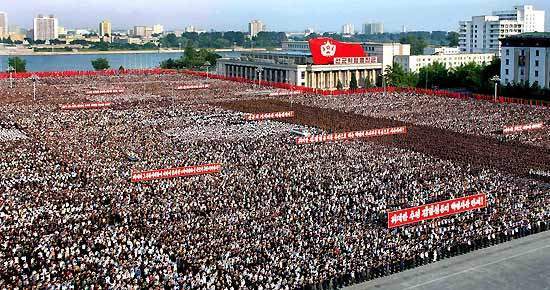 “Despite the strident hostility of the imperialist ruling classes, your Party has organized the people of the DPRK into a strong, educated, sincere force for building socialism that refuses to be intimidated. It has dealt firmly with those who would return all of Korea to the days of vassalage to international finance capital. It has guided the building up of the advanced scientific foundations of the economy and defense, and thus neutralized the constant war threats of the imperialists. Since this was written, the news from Pyongyang is that Kim Jong Un has been elected chair of the Workers’ Party of Korea and is stressing the policy of “byungjin,” which means the simultaneous buildup of both economic and military strength, including nuclear weapons. As the U.S. has threatened the DPRK with nuclear attack ever since the 1950 war, the development of such weapons by the Koreans can only be seen as a necessary defensive measure. Ever since 1953, the Koreans have asked for negotiations to end that war with a peace treaty, and the U.S. has refused. and sign a peace treaty NOW!